Instaflex Joint Support is designed for people who seek to maintain an active, healthy lifestyle even as they age. Unfortunately, our joints are among the first to grow old, so there is nothing out of the ordinary to experience pains, stiffness and lack of mobility, due to the lost cartilage. Fortunately, there are certain ingredients that were identified and clinically tested for supporting joint health even for seniors. Instaflex Joint Support is based on the most beneficial ingredients for joint repair and health, and there are also many enthusiastic testimonials from users, so this supplement is worth reviewing, to see how you can benefit from it. What Does Instaflex Joint Support Contain? While Instaflex Joint Support contains, indeed, a great list of ingredients, there are some key compounds missing, like chondroitin, which enhances the effects of glucosamine sulfate for reducing pain and promoting overall joint health. 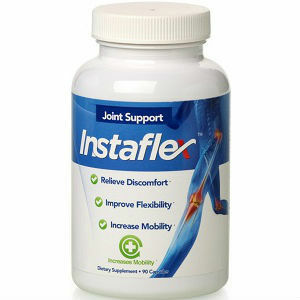 Three capsules of Instaflex Joint Support must be taken daily to enjoy the best effects. A bottle containing 90 capsules, or 30 servings for an entire month, is priced at 69.99USD per bottle, which is rather steep. The company offers 30 days money back guarantee, calculated from the date of your purchase. Instaflex Joint Support is a good product, seeing that its list of ingredients contains many of the key compounds needed for healthy joints. However, some are missing, such as chondroitin, a great companion for glucosamine, the most important compound to date for treating achy joints. The product is a bit expensive, as well, seeing that one bottle lasts for just one month. Refunds are offered if you are unhappy with the results, which is always a good thing, but you only have one month to return the product and get your money back if you are not sure the product does anything for you. Mark Stevens	reviewed Instaflex	on August 28th	 and gave it a rating of 2.